In 1943, at the height of World War II, the engineers coming from the same schools being taught by the same professors were not producing the technological breakthroughs that were needed. To get faster and better results, Lockheed decided to try something different. The company selected its most creative engineers and put them all in a tent set up at the end of a runway next to a plastics factory in Burbank, California. The engineers were told to think together outside the box on a specific project. The members of this group began to push boundaries and try new things. Without all the red tape of the standard business bureaucracy, they were able to get things done much faster, usually ahead of schedule and often with nothing more than a verbal agreement and a handshake. They became known as “skunk works” because of the smell of the plastic factory wafting into the tent. The name came from the Li’l Abner comic strip, and it stuck. Today skunk works has become a technical term in research and development and in the diffusion of innovation. It is widely used in business, engineering and technical fields to describe a group within an organization given a high degree of autonomy and unhampered by bureaucracy, often tasked with working on advanced or secret projects. The original Lockheed skunk works (which still exists) is responsible for some of the most notable advancements in technology in aerospace and defense. Such things as stealth technology and smart bombs were developed there. The Macintosh computer was developed in a skunk works project under the demanding leadership of Steve Jobs and Steve Wozniak. The first laptop was designed and developed by a skunk works group that was literally kept secret from the very organization that made it and had determined that it was not a worthy investment—Toshiba. The truth is that the church in the United States has needed skunk works for some time. For many decades all our leaders were coming from the same education system and bringing the same paradigm to the church. By God’s grace, however, many have emerged recently that are injecting the kingdom with new ideas and fresh expressions of church free from the old institutional systems that tend to perpetuate the same old stuff while stuck in a constant mode of self-preservation. When you lead a church that is established, you may need a skunk works operation of your own if you want to experience a transfusion of organic life and principles into it. We have found that a systemwide corporate change launched all at once from the top down tends to diffuse any real impact and does little to actually transform a church or its people. Such a scenario may bring about programmatic change, but it will not be internal, grass-roots and organic. That is why we suggest you launch a skunk works project on the side. It will allow the change to come from the people rather than the pastoral staff alone. You are far more likely to get buy-in on a smaller scale at first and then see sustained progress as more and more people adopt the new ideas. As a leader of your church, you can always cast vision for change, but the actual implementation may require a slower and smaller start if it is to yield holistic transformative results. Any true organic change must be internal, relational and advance virally—like a contagion from one person to the next. We believe that this requires that you start small with a unique group and let its influence spread. A skunk works approach is the best way to initiate this sort of transformation. When you initiate a skunk works project, a few things are important to consider. It is not necessary to involve many people in the beginning. It is far more important to select the right people. Every successful skunk works story emphasizes one common characteristic: the people were hand-selected, and the criteria for that selection were very important. You want people who are creative risk takers willing to try something new. Select people who will look at a situation and see opportunity rather than obstacles. You want people who tend to ask, “Why not?” when presented with an idealistic solution to a challenging problem. It is OK to combine thinkers with doers, but to start with only thinkers will be lethal to the project and to start with only doers will be hit or miss. There is no reason that you can’t have more than one skunk works project at a time, but we suggest you not spread the few innovative people you have over too many projects. If the senior leader tends to be a more innovative risk taker, that person can certainly be part of the initial experimentation, but this is not necessary for success. What is necessary is that the leader be supportive of the change and be willing to place the overall good of the church over his or her own ego. Most senior leaders tend to think of themselves as innovative, even when they are not, so seek objective advice and be willing to stay out of the way. The truth is that if this is going to work, your initial innovators will likely let you know who they are and will either not be stopped or will go somewhere else to get it done, so simply listen well to what more creative people are passionate about and give them permission to proceed. These initial individuals should know that they have permission to try new things and even to fail. Every creative endeavor requires many iterations. These people need to know that they will not have the rug pulled out from under them after the first failed attempt. Often younger people will be most drawn to this type of endeavor. Young people are naturally more idealistic and also have more freedom to try new things. The young do not have as many entrenched viewpoints and are more open to new ideas. Unfortunately, they may not have the experience to know that things will not work perfectly the first time. You may need to tell them that it is OK to fail in their attempt to do something great. The late Ralph Winter, founder of the U.S. Center for World Mission, often said, “Risks are not to be evaluated in terms of the probability of success but in terms of the value of the goal.” That is an insight worth repeating to others. 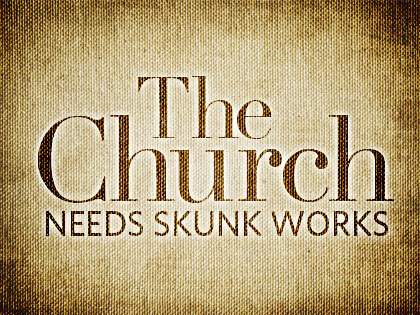 We suggest that you consider allowing the new skunk works project to progress for a time under the radar at the church. We are not condoning the keeping of secrets so much as not making a big splash that sets unreal expectations on a small band trying out something new and radical. Let the skunk workers flounder a bit and make mistakes without the pressure of all eyes being on their efforts if you can. After giving them permission, you may want to set whatever boundaries are needed. There are almost always boundaries of some sort when you talk about established churches. This is one of the prime reasons that starting from scratch is easier than revitalizing what already exists. Boundaries in established churches are often the very thing that prevents movements from happening. The extent to which you can relieve the skunk works project of boundaries will be the extent to which the new work can thrive. Does that risk problems with the new work? Of course it does, but risk is actually part of the exercise of faith, so that is not bad at all. In fact, often the old culture that you want to revitalize will put a premium on remaining safe, and risk is the prescription for overcoming this lack of faith. The truth is that a spontaneous multiplication movement will seem out of control, and the more control you demand, the less likely you will be to release any movement. Nevertheless, you likely have some boundaries that must be addressed if you are starting with an already established church or denomination. Always try to remember that the Holy Spirit is more than able to lead those He desires to use. Some typical boundaries would have to do with how the new work group communicates its new ideas to others, whom they are allowed or encouraged to recruit and not recruit, how the group relates to the church or the denomination, and what financial limitations it has. Is it necessary that the people in the skunk works project attend the Sunday morning worship service? If so, must they come every week? Do they need to tithe or give offerings to the main body? If so, what percentage? Can some of the offerings they receive go toward the new work exclusively? Are they required to practice the ordinances the same as the mother church? Can they baptize their own converts, or must the senior pastor or a paid staff member do all the baptizing? Each of these questions establishes a boundary; in fact, some of them establish entire systems of boundaries. The more restrictive the boundaries, the less likely they will be able to spin off organic reproductive movements. Ralph Moore, a friend and mentor who is the catalyst behind the Hope Chapels, taught me (Neil) something years ago that I have always valued. Ralph is Foursquare and will likely still be ordained in the Foursquare denomination when he dies (and hopefully that will be a long time away). Every church he ever started has been Foursquare, but that is not true for the people he has sent out. He has always let his church planters decide for themselves if they will be Foursquare or not. There are many churches that are part of the Hope Chapel movement but not Foursquare. When I asked him about this, he said that a movement cannot dictate everything to everyone; we must allow each generation to make up its own mind. Control and movements do not mix. That is why our own movement, though starting with Grace Brethren pastors, never remained exclusively Grace Brethren. Freedom to make decisions is a vital part of faith, and when we make decisions for people, we stymie their faith and stunt their growth. If you want to birth vital reproductive churches, you must grant them the freedom to choose. The more boundaries there are, the less likely the new works will multiply. Some boundaries have an expiration date, so let the skunk works group know if a certain boundary is only for the initial phase. That way the group members will be a bit more patient about how they set out to initiate change. In fact, if you have to set boundaries, consider putting expiration dates on the boundaries with each breakthrough so that the project can gain more and more freedom as it develops and demonstrates health. You may achieve the best of both worlds in the beginning by acknowledging the need for demonstrated faithfulness while moving toward freedom and the unleashing of movement. We have found that the fewer the boundaries, the better, so long as the people involved are centered on Christ. For instance, if your goal is to have people so sold out to Christ that they will not hesitate to tell their family and friends the gospel, you probably don’t have to set a boundary about being gospel-centered. We strongly suggest that you take a more centered approach than a bounded approach to leadership in this new work. In The Shaping of Things to Come, Mike Frost and Alan Hirsch, expanding on the writings of Missiological anthropologist Paul D. Hiebert, elaborate on the differences between a bounded set (putting up fences) and a centered set (digging a well in the Australian outback to keep livestock close). A bounded-set approach delineates everything from the outset and defines people as “in” or “out” based on how they relate to the boundaries that are established. You probably understand this because most churches and denominations function this way. Doctrinal distinctives of a denomination are a wall in a group’s bounded set. Church practices may be a wall in your bounded set: Sunday school curriculum, what school you attended, who administers the communion, or how you baptize may all be walls that define who is in and who is out of your particular culture. Attendance at a weekly service or what day of the week you worship might also be part of your bounded set. A centered-set approach defines the core values, the convictions that are central and common to all, so strongly that the people are motivated to stay close to each other and to the cause rather than needing to be controlled by any outside boundaries. People are not measured as in or out but rather by their proximity to the centered-set values. In any true multiplication movement, it is essential that the people be governed by a centered-set approach, so it makes sense to start that way with this new skunk works project. For us, the DNA (divine truth, nurturing relationships, and apostolic mission) is our centered-set value system. Hearing the voice of God in the context of loving relationships while on Christ’s mission is the glue that holds us together in a centered-set movement. We have resisted all boundaries because we do not want to slow or impede the movement that Christ is birthing—and leading. Taking a centered-set approach will of course mean a different culture for the skunk works project than for the mother church, but that is how change starts. In John 10, Jesus touches on both forms of governance as he describes the care of sheep both within a “fold” and a “flock.” When sheep are in the fold, they are in a bounded set. The walls of the fold keep them in line, and the shepherd’s work is easier. The sheep are free to venture wherever they want within the walls of the fold; they don’t even have to pay much attention. According to John 10, Jesus is the door to get into the fold. Out in the wild of Palestine in the first century, the shepherds would set up simple folds in the open air made of stonewalls with an opening on one side. There was no actual door or gate, but the shepherd would sleep across the doorway. But the sheep do not stay in the fold, where they would eventually run out of fresh grass and clean water. Jesus leads us outside the walls of the fold and goes on to speak of a flock. A flock is bound not by four walls but by its connection to the shepherd. As Jesus says, “My sheep hear My voice and follow Me.” We are meant for a whole lot more than staying penned up. We are meant to venture out into the world. It is absolutely essential that we stay close to Jesus and listen to His voice out in the dangerous world where we are lambs surrounded by wolves. The contrast between a fold and a flock is important to note. In fact, a mistranslation of John 10:16 in the King James Version of the New Testament mixed up the two terms and led to the Roman Catholic Church’s doctrine that there is just one true church and everyone needs to be in its fold to be saved. It started with Jerome and the Vulgate, where it says, “Other sheep I have, which are not of this fold: them I must also bring, and they shall hear My voice; and there shall be one fold, and one shepherd.” The actual translation is that “they shall become one flock with one shepherd” (emphasis mine), which is a whole different meaning because it places us outside of the bounded set of a religious system and keeps us all following the voice of our one shepherd wherever He may lead us. Loyalty to Christ is very different from loyalty to the bounded set of a church, and we must always keep this in mind.